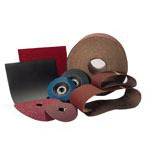 We offer a solution for all of your Abrasive and Cutting Tools and Accessory needs. We are a 3M Premier distributor with a Certified Specialist on hand to provide expertise to help you achieve the finish and cuts you need. We offer high quality products with Manufacture lines including 3M, Pferd, Weiler, Sait/United Abrasives, Greenfield Industries, Lenox, Triumph Twist Drill Co. , Fein Power Tools, Diteq, Walter Technologies, Primark, Milwaukee, and M.K. Morse. We will fit your needs for M.R.O., Production and Construction for work in grinding, finishing, polishing, blasting or smoothing. Industries we serve are Manufacturing Business working in Wood, Metals, Stainless Steel such as Cabinet Mfgs., Countertop Mfgs., Vehicle Body and Trailer Mfg., Farm Equipment Mfg. and Industrial Machine Mfg. to name a few.